In this blog post I’d like to share a special and humorous story from the Mundelein* collection that highlights an exceptional department at the college, and reminds us that while we still have progress to make in reaching true gender equality, we’ve come a long way. In 1964, twenty-four year-old, John Harper wanted to become the first man to join the U.S. Army Medical Specialist Corps’ Student Dietitian Program. 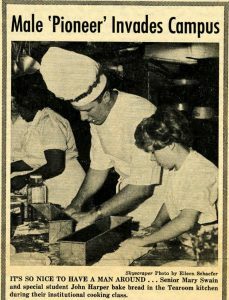 Established in 1957, the program helped female college students studying home economics become professional dietitians, and in 1964 was opened to men. Despite having his B.S. in Food Nutrition from Illinois Wesleyan University, Harper was just two courses shy of the requirement to enter the program. He began searching for Chicago area schools that offered the courses he needed, and discovered that Mundelein College, with its robust Home Economics Department, made the top of a short list. Harper found himself calling the department chair, Sister Mary Pierre, B.V.M. asking if he could register. What Harper didn’t realize (though our regular readers will) was that Mundelein College was in fact, a women’s college. 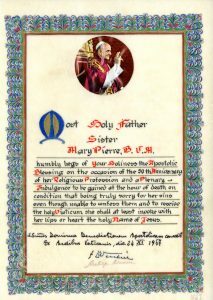 The papal blessing certificate for Sr. Mary Pierre’s contributions to the field of home economics. Unbeknownst to Harper, the Mundelein Home Ec. Department was nationally known under Sr. Mary Pierre’s leadership, herself a leading figure in the field. 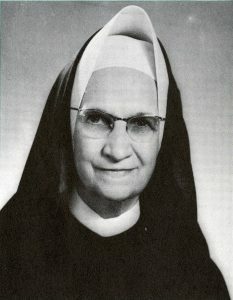 In 1946, just two years after the American Home Economics Association was founded, Sr. Mary Pierre organized the creation of the National Catholic Council on Home Economics, with the mission to improve the quality of education in Home Ec. Programs and to demonstrate that science, art, material, and spiritual values could and should be combined. During WWII students in the department were invited by the Nutrition Division of the local Office of Civilian Defense to present demonstrations and programs on meal planning with rations. Despite the unconventionality of the situation, Harper was admitted to the program as a special student and completed the needed coursework alongside his female colleagues. After graduating, he was accepted to the Army’s Dietetic Internship Program, and trained to serve in Army hospitals throughout the world. 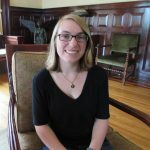 Kate is a Graduate Assistant at the WLA and in the second year of her M.A. in Public History at Loyola University Chicago. A Colorado gal, she enjoys classic films, bike riding, and all things museums.